Agriculture plays an important role in the economy of the Lao People’s Democratic Republic (Lao PDR). The country's major crop is rice, which account for 50% of the national agricultural output. Other major crops include maize, cassava, banana, and coffee, which are grown for both subsistence and commercial purposes. Livestock production, which accounts for 18% of agriculture gross domestic product (GDP), contributes a significant amount to household and national income with most farm families owning some livestock to be used as a form of household savings or for commercial sales. 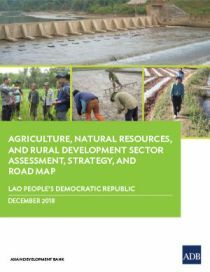 The Asian Development Bank (ADB) prepared this sector assessment, strategy, and road map to explain the evaluation and strategic investment priorities of the Government of the Lao PDR and ADB in the agriculture, natural resources, and rural development sector. This report highlights sector performance, priority development constraints, government plans and strategy, past ADB support and experience, other development partner support, and ADB's future strategy for this sector. It informs ADB’s country partnership strategy for the Lao PDR and is updated as strategic developments and program changes occur. It helps provide sector background information for ADB’s investment and technical assistance operations, which include projects under the Greater Mekong Subregion Economic Cooperation Program.